December’s here, so it’s time for another roundup. When the luminous Mrs. V. asked me about what I was reading this week, it turned into a conversation about short stories, then and now. At some point I said something along the lines of short stories have always been hit-and-miss, with most stories being satisfying, some terrific, and even a big name doesn’t always knock it out of the park. In fact, anyone might hit a home run, so a magazine like Heroic Fantasy Quarterly, featuring unknown and lesser-known writers, is just as likely to contain excellent stories as any of Lin Carter’s anthologies. That’s why I persist in reviewing new short stories each month. There’s a chance each and every month that I’ll discover a story that measures up to the best of the past, and will be worthy of a place in some future anthology of great swords & sorcery tales. That’s the sort of anticipation I have when I open up a new issue of HFQ each quarter. Adrian Simmons, David Farney, William Ledbetter, James Frederick William Rowe, and Barbara Barrett are the names on the masthead, and swords & sorcery fans should thank each one of them for consistently putting out the best new S&S and with far less attention than they deserve. I won’t say any of the latest volume, #34, is among the greats bound to last, but all three are very good. Can you really ask for more than that? Atkisson’s story furthers the adventures of his half-Comanche hero, Crazy Snake. Last time around, in “Crazy Snake and the Tribute for Pachacamac,” he ended up in Nicaragua during the mercifully short rule of the filibuster William Walker. In addition to Walker’s soldiers, Crazy Snake faced off against an assortment of evil supernatural creatures. Now, though Walker’s army has been defeated, the man himself remains at large. Believing Walker is the white man his bruja mother prophesied he would face off against one day, Crazy Snake tracks him down, through a lake of monsters, to the double volcanic island of Ometepe in Lake Nicaragua. At that moment the pond erupted, spraying everyone in the crater. The fighting ceased, and they all turned. There, above the water, was a sight before which every man shrank back: a creature of nightmare, not unlike those Crazy Snake had glimpsed from afar in his vision, with vast, brightly feathered wings that seemed to span half the pond, the deep thumps of their beating filling the stunned silence. Its talons, too, were those of a raptor’s, but its golden-hued body was serpentine, with a long, barbed tail, and its head strangely feline–like a jaguar’s. There’s no deep meaning in this story, other than, perhaps, fighting monsters and thwarting extra-planar entities is dangerous work. All I, and most S&S fans, want from a story like “Demons of Ometepe” are thrills, chills, and excitement. This is not a dumb thing or a lowest common denominator thing. Instead, it’s a desire to find some respite from the drudgery we often find ourselves clobbered by in our daily efforts to stay abreast of real-life responsibilities. Maybe people who lead lives replete with real derring-do don’t need an escape hatch, but I find I do. Enough of the sermonizing. With no obvious magic and little swordplay, the next story, “Hunger’s End” by Scott Shank, would barely seem to qualify as S&S, and yet I found it one of the best S&S stories I’ve read in the past few months. It’s easily the one that’s going to stick with me the longest. The setting and several scenes are exactly what I hope to find when I crack open the electronic pages of HFQ every three months — haunting images that will lurk in the back of my brain for days to come. For nine days they had tasted no bread. For five days they had tasted no flesh. The last of their arrows they had lost to the sun-eating canopy, for the little blackcaps that flitted among the branches were too swift. Of other game, there was no trace. No creature was foolish enough to tread the root-heaved floor of dark Kuthao. None save man, thought Angkoshi. He stumbled forward, refusing to peer through the webs and clouds of gnats, into the silent forest, training his eyes instead upon the broad back of his captain, Bazitur. Angkoshi and his commander, Bazitur, are the only remaining members of a detachment sent into the forest of Kuthao with orders to find and restore contact with any surviving settlements or monasteries engulfed by the forest’s relentless encroachment. For some unspecified time, the forest has been growing over and swallowing alive whole chunks of a kingdom. The current king has sent parties into the green void in order to restore his realm, but there have been no successes, and Angkoshi believes he’s part of one more failing effort. Trekking from their encampment in hope of finding supplies, survivors, anything, Angkoshi and Bazitur are excited by a column of smoke. Following it, they find a dilapadated monastery, and within, a single survivor. How he has survived, how the two soldiers might survive, is the crux of the story, and Shank paints it it in eerie colors reeking of smothering, arboreal death. I swear, even now, I still feel the overwhelming press of the Forest of Kuthao around me. The final story, “Dragon in Amber” by Patrice Sarath, is told by the dragon Arauch. He has been held prisoner by humans for ages. Now, in exchange for his freedom, they want him to destroy an army invading their realm. Despite the presence of a mighty army complete with tower-backed elephants and camel cavalry, this story is really one of the relationship between Arauch and his jailor, Weith. Their mutual distrust is slowly tempered and modified, eventually leading to the dragon’s emancipation and the man’s betrayal of his people. I liked this very much, especially Sarath’s willingness to portray Arauch as a fierce man-eating monster that revels in its ability to mete out flaming death and destruction. There are poems, as always, in HFQ. The first, “The Barghest’s Revenge” by Adam Vine, is a chill-inducing story of a monster-hunter and his foe in some spectral Scotland. I’m not sure what “Great Poet Emperor” by Meg Mossman is getting at, beside creating a strange image that doesn’t readily fade from view. Finally, “Gæscligcrymblingas”, by Ariel Bolton, is not a poem as such, instead, as she describes on her site, it’s a tribute to Edward Gorey’s “The Gashlycrumb Tinies.” Just read it and appreciate the joy that only the grisly deaths of Anglo-Saxon heroes rendered as nursery rhyme can bring. 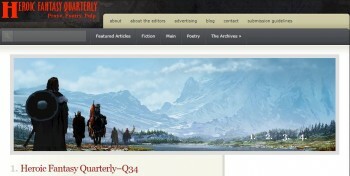 The Best of Heroic Fantasy Quarterly: Volume 2, 2011-2013 is out, and it’s beautiful. Too long ago, HFQ published its first Best of Anthology. I reviewed it here. The latest installment, compiled by the editors of Heroic Fantasy Quarterly, culls the best stories from Issues #9 through #16. I’m not going to go through a story-by story review here. Instead, I’ll direct you to the reviews I did of many of these stories when they first came out back between 2011 and 2013. I’ll try to get to a full review in the next month or so, but a lack of a review by me should in no way discourage you from going straight to Amazon in order to secure your own copy. Normally, I get only e-books these days — too many books, too little shelf space, the usual — but I saw the cover art by the multi-talented Robert Zoltan and I wanted to have this volume in the flesh, so to speak. What I didn’t know was that the book is also filled with wonderful illustrations from Katarina Deggans, Raphael Ordonez, Simon Walpole, and Miguel Santos. Like the stories and poems they ornament, the pictures range from bold to subtle, evoking excitement or terror, as befits the tale. I have high hopes for the forthcoming Tales from the Magician’s Skull, and I’m looking forward to them going head to head with HFQ and others, tracking down the best new stories. Right now, though, Heroic Fantasy Quarterly is the undisputed champion publisher of the finest swords & sorcery stories being told. If you haven’t visited its digital pages, get thee hence at once. You’ll thank me for it. 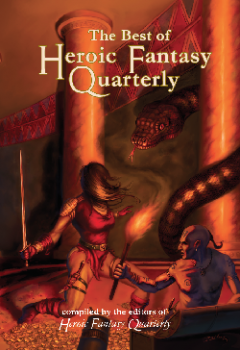 If you are a habitué, then there’s no excuse for you not having already purchased a copy of the second volume of The Best of Heroic Fantasy Quarterly. “In fact, anyone might hit a home run, so a magazine like Heroic Fantasy Quarterly, featuring unknown and lesser-known writers, is just as likely to contain excellent stories as any of Lin Carter’s anthologies.” We’ve recently added “Classic Genre, New Voices” to our website description for just that reason! I’m quite pleased with “Crazy Snake and the Demons of Ometepe”. I think it rounds out our South American Triple-Crossover quite well. Although I probably should have included the actual picture of Ometepe like you did! Dragon stories are getting to be a tougher and tougher sell for us, but Patrice Sarath’s “Dragon in Amber” was unique enough that we had to make a place for it. “Hunger’s End” was probably the biggest risk we took on this issue– it is really more of an ‘atmospheric piece’ than action or straight S&S. Still, it looks like we gambled and won on it! Thanks for plugging the Best-of Anthology, I look forward to hearing what you think of it (at least the material from issues 9-11). Thanks for the kind words, Fletcher! I hope the book does really well, as it deserves. Good luck, Adrian! !